Five hundred years ago a stricken ship, the Victoria, limped into the port of Seville. Its crew of 18 were all that was left of the 265 men that started out three years earlier. They were half-dead from starvation and disease, having just completed a voyage that would change the course of history and profoundly shape the way we live today. Victoria was part of a fleet of five ships commanded by Ferdinand Magellan. His quest was to get to the unimaginable riches of the Spice Islands through the New World, making Spain the richest country in the world. 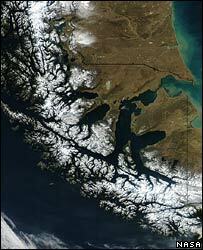 And of course Magellan would have the fame and share the wealth. Magellan never planned to, wanted to, or indeed did, sail around the world. When he set off on this voyage, the plan was to get to the Spice Islands and then return the same way back. Yet, still today in many countries, it is Magellan who gets the credit for being the first person to circumnavigate. But the reality - as I found out in Spain while making the BBC's Voyages of Discovery series - is that it was another great man, Juan Sebastian Elcano, who has the honour of being the first circumnavigator. The Portuguese controlled the known route eastwards to the Spice Islands so Magellan had to pioneer a new route westwards. No-one had ever sailed this way before, and the map was worse than blank - it was wrong and off by over 11,000km. The fleet of five ships set off across the Atlantic. It was a hair-raising passage. After months of searching the east coast of South America, Magellan was faced with the fact that he could not find a passage west. He was forced to endure a brutal winter which included a starvation diet, freezing conditions, mutiny and murder. 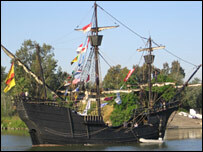 The Nao Victoria, a perfect replica of the original Victoria, completed a re-creation of the journey this year. I was lucky to be able to join her on the Mediterranean passage, which turned out to be much more challenging than I expected. As an experienced sailor of modern boats, I was amazed by the amount of rolling she did and the hard physical labour needed to sail her. Even in slight waves, we rolled so much that the deck was always awash. We could hide in our bunks below deck; but the original sailors had to sleep on deck, with cargo and rigging being the only possible shelter. It must have been desperate. After surviving the winter and many months of fruitless searching, Magellan and his men were finally rewarded - they found the passage through to the other side of South America. It was a fantastic achievement. Magellan named the ocean the Pacific - the Peaceful Sea. He thought the hardest part of the voyage was over, and anticipated a short cruise to the riches of the Spice Islands. But the combination of bad maps, bad calculations and the fact that he was the first European to be in these waters, turned this "short cruise" into a 100-day nightmare of starvation, scurvy and death. Magellan could not have even imagined the scale of the Pacific; it encompasses one-third of the Earth's surface, it's twice the size of the Atlantic Ocean and extends over an area greater than all the dry land on the planet. Eventually, the fleet arrived in the Philippines. Even today, an annual celebration marks this event - but not in the way you might imagine, or indeed as Magellan would have wanted (it was in the Philippines that he died in battle). I attended this year's celebration and I was shocked by the ferocity of the ceremony. It is a passionate and bloody display that includes the slaughter of chickens and pigs. A powerful celebration of a great victory. It became important to me to tell the true, barely credible story of this amazing voyage of discovery. No wonder the Victoria continues to receive honours to this day. 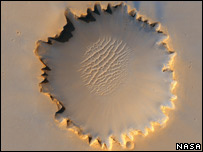 In fact, a massive unexplored crater on Mars has been named Victoria Crater by the Mars Rover science team in recognition of the 1519-1522 circumnavigation by the Victoria. 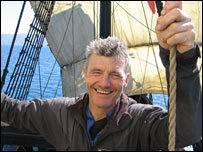 Paul Rose retells the story of Magellan, Elcano and the Victoria in Voyages of Discovery - Circumnavigation, which goes out on BBC Four on Thursday, 23 November at 2100 GMT (and is then repeated over the next two days). Paul Rose was the base commander of the British Rothera research station in Antarctica for 10 years.